SMBC has a long tradition of commitment to the priority of biblical preaching. We believe that God’s word is the means by which God's kingdom comes, churches are planted, souls are saved and lives are transformed. Our Centre for Preaching and Pastoral Ministry trains and develops its students to be preachers and pastors who handle God's word skilfully in order to preach Christ faithfully and connect it engagingly to people and the world they live in. Why Preaching and Pastoral Ministry? As preaching most often occurs in a pastoral context, our goal is to prepare and develop preachers who regularly feed God's people with God's word in the local church – whether in Australia or overseas in cross-cultural ministry. We do that by teaching and modelling expository, Christ-centred preaching. Preaching and pastoring are inextricably linked to one another. Pastoral ministry is grounded in the preaching of God's word that proclaims Jesus as Lord. Preaching is necessarily informed by pastoring God's people to love and follow Jesus. We aim to prepare our students to not only be skilled preachers of the word but also to have a holistic understanding of the primary context in which preaching takes place week by week. Critical to this is a foundation of personal godliness and a life of prayer. Preaching is not an end in itself. Its purpose is to prepare God's people for works of service so that the church may be built up to be united in Christ and to grow up into Christ (Ephesians 4:11-15). To prepare students for a lifetime of gospel ministry SMBC gives priority to training students in preaching. This training involves teaching and modelling ministry, with a strong emphasis on practising preaching. It's our conviction that students only improve as preachers by preaching regularly. All full-time students study 'Foundations of Preaching'. This unit of study offers training by experienced preachers in how to prepare, structure and deliver a sermon; how to illustrate and apply the biblical text; as well as an overview of the goal of preaching. Classes Students prepare and preach an expository sermon in these weekly, small group workshops. In a collaborative environment, the lecturer and students discuss each sermon and provide feedback. 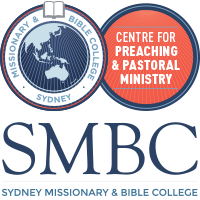 At Principal's Hour each week, the College community gathers to sit under God's word, where expository, Christ-centred preaching is modelled by SMBC lecturers and guest speakers. Students have the opportunity to preach at College chapel services, where they receive feedback from a lecturer and fellow students. SMBC’s popular Biennial Preaching Conference has been running since 1993. It focuses on expository preaching through books of the Bible. A range of experienced international and local speakers are invited to speak. The conference usually runs for four days, including evening talks. The mealtimes provide a great opportunity for fellowship and networking. To develop preaching skills so that preachers connect the truths of God's word to their listeners and culture. Specialised postgraduate intensive units on pastoral matters, for example, Christian mentoring, Self-Care and Resilience. Rev. Mark Adams leads an experienced and diverse team. Mark is Pastoral Vice-Principal and lectures in theology, spiritual formation, pastoral care and preaching. Prior to joining SMBC in 2013, Mark was senior minister at New Life Presbyterian Church, Gungahlin in Canberra for twelve years. He previously practised as a lawyer in Sydney for ten years until 1998. Rev Dr Malcolm Gill has taught preaching at SMBC since 2009. He also lectures in Greek and New Testament, having earned a Ph.D in New Testament. Malcolm regularly speaks at churches and Christian conventions. Prior to joining SMBC, Malcolm served as the evening minister at St Barnabas Anglican Church in Broadway, Sydney. Jenny Salt is Dean of Students and lectures in spiritual formation, pastoral care and preaching. She has taught at SMBC since 1997. Jenny speaks regularly at women’s conferences and events both internationally (Gospel Coalition in US; South Africa) and throughout Australia (Katoomba, Brisbane, Perth, Melbourne, Tasmania), and has recently contributed to the ESV Women’s Devotional Bible (2014). Pierre Thielemans is Dean of Single Residential Men and lectures in Greek, spiritual formation and preaching. He serves as an elder at Ashfield Presbyterian Church, where he also preaches. Pierre is an experienced TESOL teacher, who has preached in numerous cross-cultural contexts both locally and overseas. Janet Riley is Dean of Women and lectures in Greek, pastoral care and preaching. Prior to joining SMBC, Janet worked as women’s and children’s pastor at Randwick Presbyterian Church. Janet speaks regularly at women’s events and conferences.